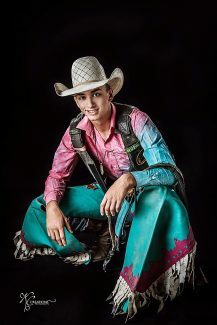 Dodge Daniels, a bullrider in the Nebraska High School Rodeo Association, will join the U.S. Marine Corps this August. He lives in Scotia, Neb. CRAWFORD, Neb. 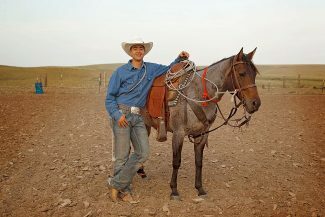 — Two Nebraska High School rodeo athletes are headed for the U.S. Marine Corps. Dodge Daniels, Scotia, Neb., and Ralph Saults, Big Springs, Neb., are Marine recruits and will head to boot camp this summer. Daniels, the son of Joan and Leroy Leth, has wanted to be a Marine since he was young. A friend of his mom's, Kip Hughman, was a Marine who left a big impression on him. "He's a really great guy," Daniels said. "He's smart, and has a level head. I've just always looked up to him." Saults has also wanted to be a Marine since he was young. "When I was little, I drew pictures all the time of the Marine Corps symbol, of Semper Fi." His mother's cousin and her brother-in-law are retired Marines, and their influence on Saults had an impact on him. Daniels will graduate from Central Valley High School next month. In high school, he played football, wrestled, and was involved in FFA. He loves to hunt and fish, and would like to make a career out of the military. Saults, the son of Scott and Jill Saults, will graduate from Big Springs High School in May. In high school, he played basketball, was in FFA, FCA, and was on the quiz bowl team. Saults was on the honor roll every semester from seventh grade throughout high school. Like Daniels, he loves to hunt. Both men are planning on going into infantry, and both will attend Camp Pendleton, near San Diego, Calif. Daniels will leave in August, and Saults will go in September. After boot camp, both will go to the Marine Corps MOS (Military Occupational Specialty), where they will refine their studies for more specialized roles. Saults is looking forward to being a "leatherneck," for several reasons. "Their morals are great, they strive for perfection, they are loyal, they emphasize teamwork, honor and leadership," he said. "Everything about the Marine Corps is good. It's a brotherhood. It's something I like." If the men stay in the Marine Corps for four years, their college will be paid for. Saults isn't sure, but he thinks he'll like it. "The way I see it, if I love it, I might stay, or not. It's only four years out of my life. They pay for my college, and they set me up for greater things. If I hate it, it's only four years of my life. More than likely, I'm not going to hate it. I'll like it." Both men are members of the Nebraska High School Rodeo Association. Daniels competes in the bull riding; Saults is a tie-down roper and team roper. Daniels finished the 2017-2018 high school rodeo year in third place in his event, and went on to represent Nebraska at the National High School Finals Rodeo. Saults competed at state finals the past three years and is the 2017-2018 state high school rodeo light rifle champion. He competed in the light rifle shooting at the National High School Finals Rodeo. The Nebraska High School Finals Rodeo will be held in Hastings at the Adams County Fairgrounds June 13-15. The rodeo is held at 10 a.m. and 6 p.m. on Thursday, June 13 and Friday June 14, with the finals at 1 p.m. on June 15. Tickets are $7 for everyone ages 5 and up and are available through the office and at the gate. For more information, visit AdamsCountyFairgrounds.com or hsrodeo-nebraska.com, or call (402) 462-3247.